We’re up and happening on Pinterest. I’m still getting my head around the whole social media thing and my jury is still out on it, but for those of you who are into Pinterest, I thought I’d let you know that I’ve set up a site that showcases a lot of the photos that have appeared so far on the blog. 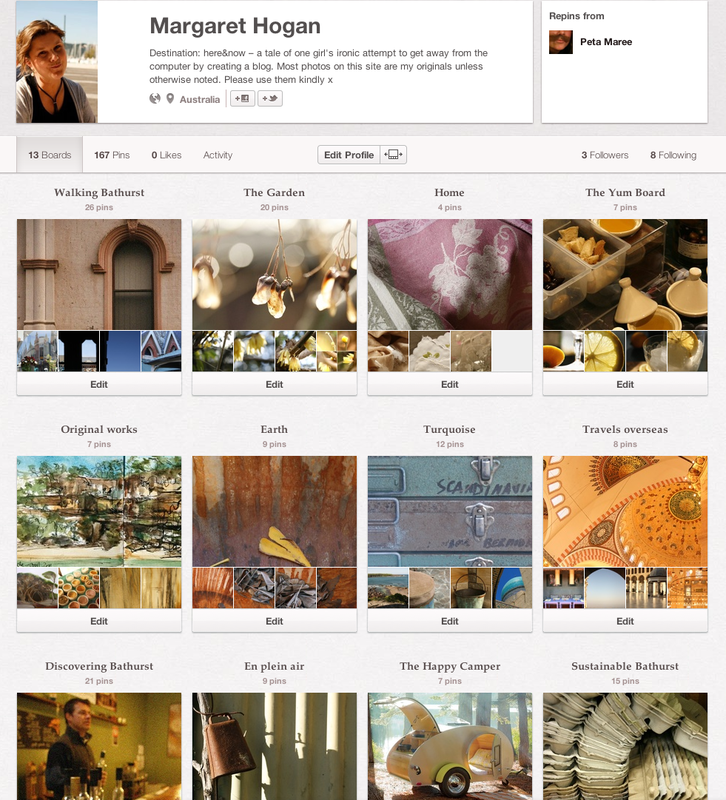 I’m actually really impressed with the Pinterest interface – it’s beautiful to use. If it is your thing and you’d like to take a look: just click here. What’s your take on social media? Do you reckon it’s all it’s cracked up to be? This entry was posted in Art, Discovering Bathurst, Photography, Travel and tagged Bathurst, color, colour, photography, photos, travel by Margaret Hogan. Bookmark the permalink. That’s how I got it going. I don’t know how to do it from files on my computer but I believe it’s possible. Once you’ve got it set up you end up with a PIN IT link in your menu. Also…when you do start pinning don’t make the mistake I made and click on the photo on a blog to then pin it. All that does it take you to the photo, not the site. Instead, when you’re on a page you like just hit the PIN IT tab I mentioned above and all the photos on that page will appear as thumbnails and you pick which one you want. Come back to me if you get stuck.